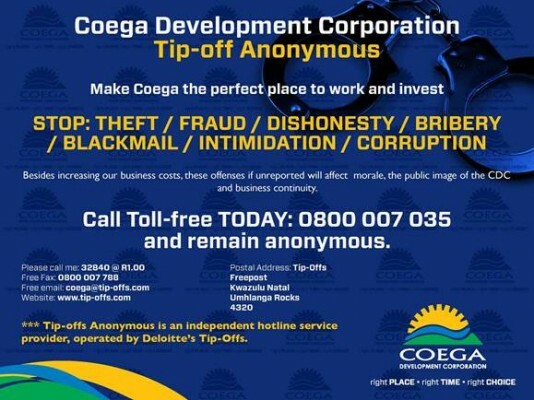 Coega Development Corporation dismisses its Senior Employee for Fraud and Corruption. The Coega Development Corporation (CDC) as an institution in earnest that seeks to adhere to high moral values and standards is founded on sound global governance and ethical business principles. To this end, the CDC proactively encourages all its employees and broader stakeholders to uphold and adhere to the laws of the country at all times. Talking about the eradication of fraud and corruption, in February 2016, the CDC received a report about fraud and corruption allegedly committed by the Senior Programme Manager (Facilities Management) of the CDC, Mr Simphiwe Gift Honi, who worked on one of the CDC Client’s Programmes, i.e. the Eastern Cape Department of Health - Infrastructure Programme . In light of the seriousness of these allegations, the CDC acted swiftly on the allegations of fraud and corruption and instituted an immediate investigation followed by an internal disciplinary hearing, chaired by an independent and suitably qualified practitioner. The disciplinary hearing confirmed the allegations and concluded that Mr Honi be dismissed with immediate effect, which has since been implemented. During the course of the investigation against Mr. Honi, further allegations surfaced that implicated a Senior Employee of the Eastern Cape Department of Health - Infrastructure Development Programme. In addition to reporting the allegations to the Client, the Eastern Cape Department of Health, the CDC has also filed a report to the South African Police Services - Directorate for Priority Crime Investigation (DPCI) for further investigation, which is currently underway. In matters of this nature, the CDC seeks to always act swiftly and wishes to reiterate one of its founding principle values of Integrity - Our organization is based on good governance and business principles. We believe in transparency, and have a zero tolerance for fraud and corruption. 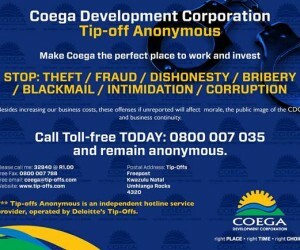 Therefore, we would like to encourage all stakeholders to proactively join hands with the CDC and play an active role in ridding our society of any ill-conceived practices and contact the CDC Tip-off Anonymous line.